Click here to download the 2015 entry form. 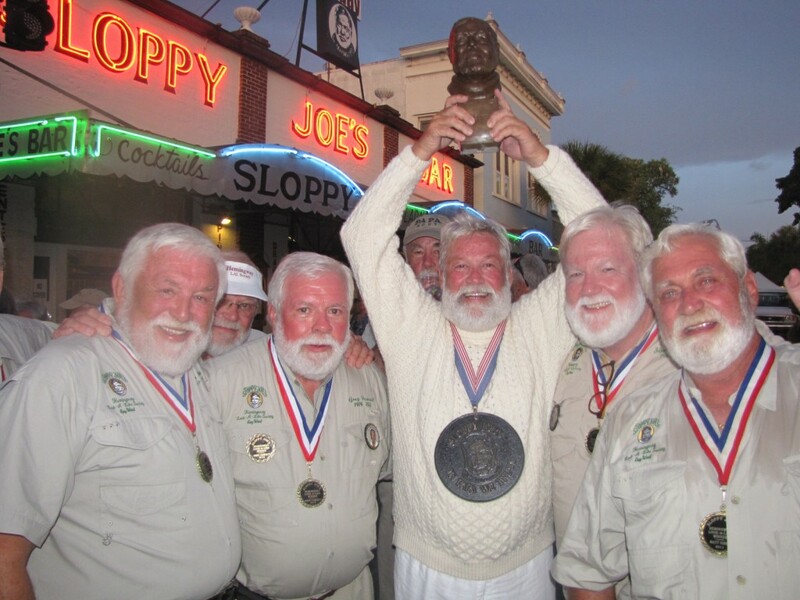 Each preliminary round of the ‘Papa’ Hemingway Look-Alike Contest will begin at 6:30PM, and finals 6:30pm in Sloppy Joe’s Bar (201 Duval Street) on three consecutive evenings, July 23-25, 2015. Look-Alikes must compete in one of the preliminary rounds in order to be eligible for the finals on Saturday. Pre-register by mail is recommended, as space is limited to 75 contestants a night. Use the form above, print out form, complete information and mail it along with the indicated fees. Please indicate whether you will compete in the Thursday or Friday preliminary round. On the day of the contest, check in at the registration table near the stage at 5:00PM. All Look-Alike contestants receive a ‘Contestant’ Hemingway Look-Alike t-shirt. If not pre-registered, you may sign up prior to either preliminary round at Sloppy Joe’s if space is available. Although the contest doesn’t begin until 6:30PM, Thursday, Friday and Saturday, spectators and some contestants arrive early in the afternoon. Remember that this is summer in Key West. The temperature on stage under the lights can get pretty hot, there will be hundreds of folks in and around the bar, there’s no reserved seating, and television crews will be jostling for the best camera angle. Basically its chaos, so please be patient. Contestants will be called up on stage in groups of eight, in alphabetical order, and introduced to the audience. Contestants will have 15 seconds to speak to the judges and audience. If wearing a hat, contestant will be asked to remove hat so that judges will be able to see their face. We are looking for mature, heavy-set men with a full beard. However, several young Look-Alikes have participated and some have actually made it to the finals. Contestants participating in contest agree allow their image to be used by Sloppy Joe’s and media, and grant photo release (must sign above talent release form). Approximately twelve finalists will be chosen on Thursday, and twelve on Friday to advance to the final round on Saturday. Finalists will be announced from stage and contestants will be asked to come on stage. On Saturday, finalists will be called up on stage in groups of five and given one minute to present themselves to the judges. The group will be narrowed down to five finalists. The five finalists will be announced one at a time and have two minutes to speak. Papa 2015 will be named from this group. Papa 2015 will become a Judge for future contests an no longer able to compete in future contests. Judging is handled by former Look-Alikes winners. Know your competition. The Look-Alikes arrive in ‘Hemingway Garb.’ Some even wear safari outfits, khakis, and even the excruciating hot wool fisherman turtle neck sweater. Many entrants have been competing for years. Some bring their own cheering squad. Most contestants admit (confidentially) that they may never win, but return year after year for the fellowship. The Hemingway Look-Alike Society (HLAS) is very dedicated to the Hemingway Look-Alike scholarship program. The HLAS began in 1999 giving one $1,000 scholarship and since have given away over $150,000 in scholarship money to students studying in the Florida Keys. This has made the HLAS the biggest contributor to the Community Foundation of the Florida Keys. The judges are looking for someone who: Looks like Hemingway; someone who will return each year to judge contest and work on scholarship program; Looking for honorable individual to represent the Society. Faithfully, the wives, known as the ‘Mama’s’ spend their time and vacations promoting their Papas, and return to Key West each July for the event. Note: Please do not bring any type of balloons they will not be allowed in bar. No animals/birds will be allowed on stage.